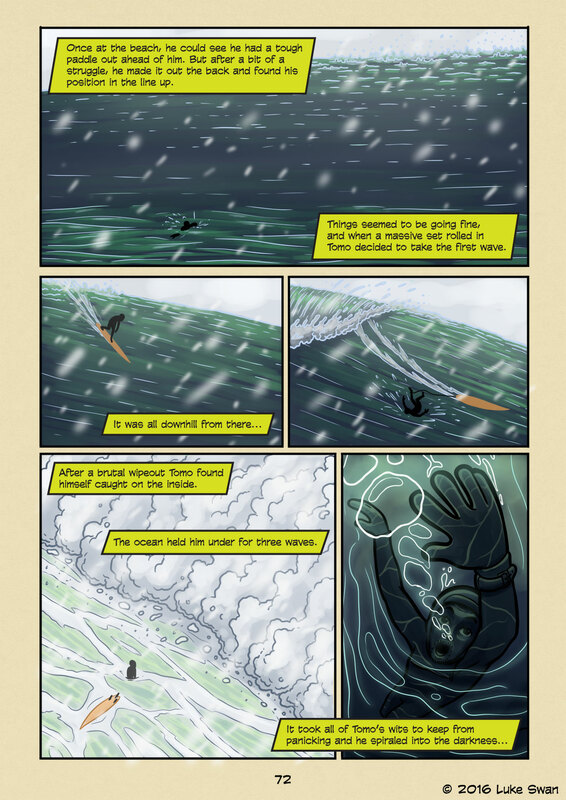 Held Down(#072) | Web comic "Surfer Joe"
Wiping out usually isn’t too bad. 9 times out of 10 you punch through the water surface, far enough away from your board. The wave rolls past you. If you wipe out in the critical section of the takeoff you can expect to get rolled, and it’s good to cover up in case your board decides to slap you in the face. The prospect of wiping out is an idea you have to get used to as a surfer. It’s going to happen, a lot. After a while, it starts to get fun even. Being held down is a whole other can of worms though. You’re separated from your board. The waves are big enough to give a proper beat down, and you have no choice but to dive as deep as you can. Even then you are going to go for a ride in the wash.
It’ll test your ability to hold your breath, which is greatly impacted by your ability to relax. Most of us are panicking at this point. You pop out of the water just in time to wear the next wave as a hat. The second time the ride isn’t so peaceful, and you have even less air than before. Swim to the surface as fast as you can and hope there is a lull long enough for you to retrieve your board. If you are reading this then no, it wasn’t. Congratulations.